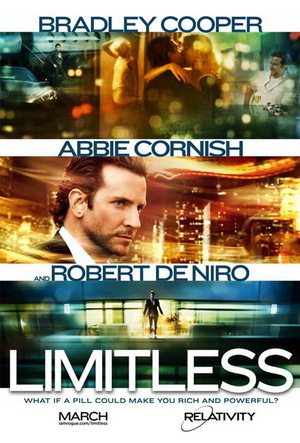 Earlier this week, I saw the new film Limitless that stars Bradley Cooper, Robert De Niro and Abbie Cornish. …but even in the movies there’s no such thing as a free lunch, and soon Morra finds himself not only suffering sinister side-effects from NZT-48 but also attracting attention from sinister people – and as a result, his life becomes even wilder and crazier. I liked Limitless a lot, for several reasons. First, it was great fun. It’s an exciting thriller that’s never dull and moves at a frenetic pace. True, even within its own fantastic realm it stretches credibility at times, and thinking more about it afterwards reveals plotholes here and there, but even so Limitless is still a great thrill-ride – and for me it was also cathartic, which I will get to in a moment. Second, Limitless is very thought-provoking. Even before I saw it, the main premise intrigued me and got me asking myself several questions. What if I was offered a drug like NZT-48? Would I take it? And if so, what would I hope to achieve from it – and could I handle both taking the drug and whatever success it provided? Adding fuel to these thoughts was this interesting discussion at Hollywood Elsewhere. Third, as I mentioned above, seeing Limitless was very cathartic due to a recent experience at work. Up until the day I saw Limitless, I had spent the previous week putting together a major technical document that was demanding and draining – and several times when that document was driving me nuts, I fantasized about having a drug like NZT-48 to help me get it done. Fortunately, a checkpoint meeting only hours before I went to see Limitless affirmed that I was making very good progress with the document, so after that I was able to relax and enjoy my evening even more. Finally, towards the end of Limitless, I had a major realisation. …and then, not long before the end, I realised that I am actually living a Limitless life. To reiterate one of the major themes here at Black and Blue Man, thanks to my medication and therapy since mid-2007 I have been living the best years of my life. Thanks to unlearning bad emotional and mental habits, and being more willing to step (and sometimes jump) out of my comfort zone, each day I am experiencing and enjoying more about living. And of course, things can still keep on getting better and better. So not only did Limitless turn out to be very entertaining, but it provided an epiphany as well. It was a great night at the movies, indeed. This entry was posted in Happiness, Inspiration, Life is Good, My Story. Bookmark the permalink.